Today we will go behind the scenes on Main Street USA in Disneyland. First things first, turn on the Main Street USA background music….did you turn it on? Then you are ready to go. Every guest that enters Disneyland walks down this entrance street. But, it is so much more than just a walkway to the rides. Main Street USA is like the opening scene to your favorite movie. By the time you walk through the quaint middle America town, you are ready for all else Disneyland has in store for you. I love Main Street USA. When I think of this magical small town, I can smell buttery popcorn and want to start humming “Sunday Clothes.” That’s why I decided to start my series of posts diving into the secrets of each land here on Main Street. So, what are we waiting for? 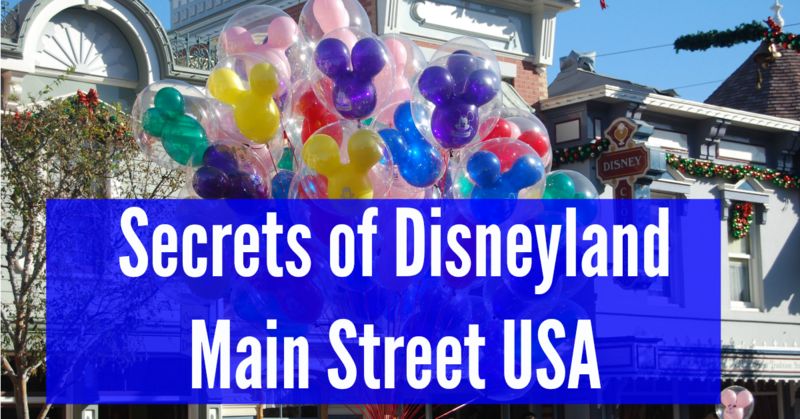 Here are some of my favorite secrets of Disneyland Main Street USA. #2. Flag Pole or Light Post? Walt Disney added Main Street USA to the plans of Disneyland because he wanted a land that would not only represent his hometown, but the hometown of every one of his guests. Because Walt Disney was the dreamer behind the entire park, many credit his hometown of Marceline, Missouri as the inspiration for Main Street USA. While this small town where Walt Disney spent his boyhood years may have inspired him to add the area to his plans for the park, it was another small town that inspired the final iteration of Main Street. Main Street USA was designed by Walt Disney Imagineer Harper Goff who took photos of his childhood home of Fort Collins, Colorado to create the designs for the buildings. Disneyland City Hall is modeled after the Fort Collins County Courthouse. One of the lightbulbs at the corner of the Coca Cola Refreshment Corner at the top of Main Street is painted half white, half red. The story goes that Walt Disney was walking through the park one day and saw two white bulbs next to each other. 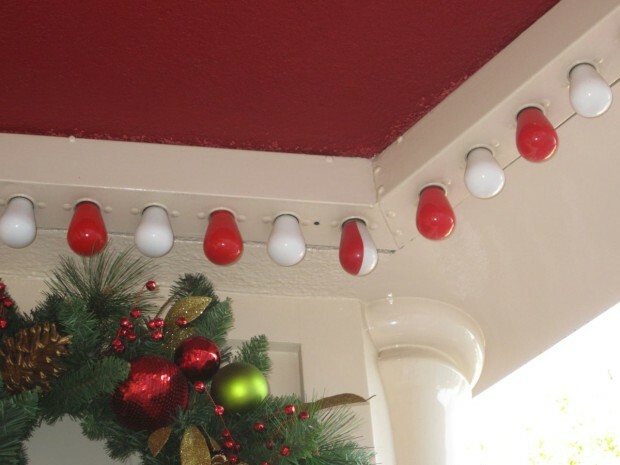 Walt called a painter over and had him paint half of the white bulb red to correct the pattern. Either the bulb has never burned out, or the bulb changer comes with a can of paint as the alternating scheme of red and white remains to this day. 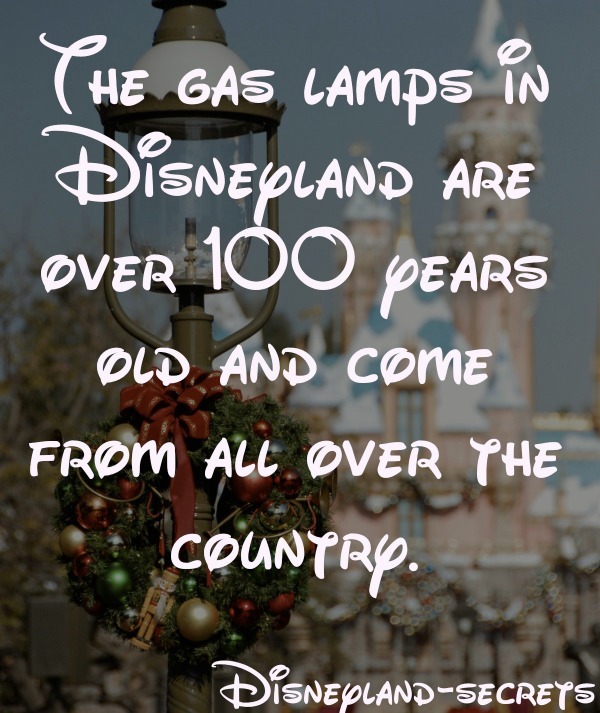 Find more Disneyland Secrets like this here. These street lamps were purchased from cities all across the US including Baltimore, Saint Louis, and Philadelphia. The Disney company purchased a majority of these lamps as scrap metal at a price of $1 a pound. The cannons surrounding the Disneyland flag pole are authentic French cannons from the 1800s. These cannons were never fired, but their presence in Town Square adds a note of authenticity to the area. Many public parks across the country feature tributes to their fallen soldiers. These cannons act as a tribute to all service men. The black base of the Disneyland flag pole is the broken piece of a light post from Wilshire Boulevard in Los Angeles. 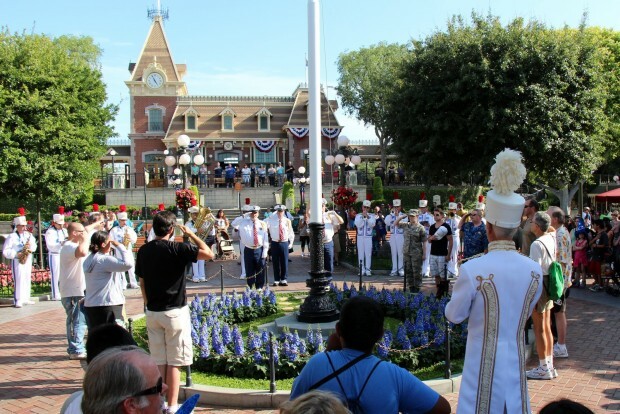 This photo of the Disneyland flag retreat comes from the site My Crazy Loves. Set Decorator Emile Kuri was driving home from Walt Disney Imagineering one day and saw that one of the light poles had had been knocked over in a car accident. He bought the base of the pole as scrap metal for $5 and it became the base of the Disneyland flag pole. The Disneyland fire wagon can still be seen today parked inside of the Disneyland firehouse. This beautiful shot is by Tours Departing Daily. 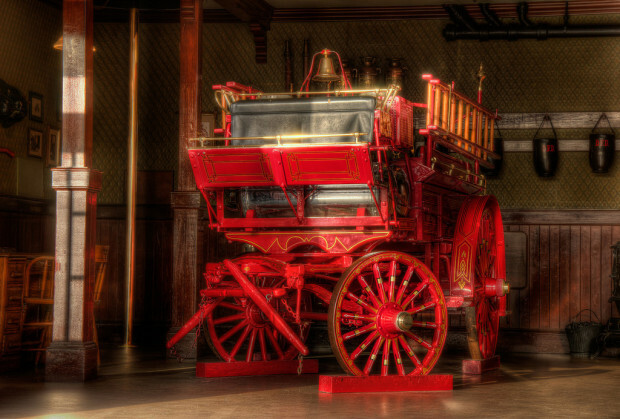 The fire wagon that sits inside of the Disneyland Firehouse was an opening day attraction. The wagon was pulled by two horses up and down Main Street until it was taken out of commission in 1960. Well that’s all of the stories that we have time for today. This summer I am publishing my very first book featuring the stories and secrets of Disneyland. The book will highlight stories from each land of the park. For more information on the book and how you can get free copies, sign up for our Disneyland Secrets book notification list*. *This is a separate email form from our Disney Dose newsletter, which you can sign up for here. Obviously, that should be ‘paint’ as opposed to ‘painted’. I’m loving the site and thanks for all of the awesome secrets that you’ve posted! Thank you for the heads up. So glad that you are enjoying the website. The article you linked to states that Fort Collins AND Marceline were used as inspiration for Main Street. Thank you very much for pointing that out Scott. Marceline was not the direct inspiration for the design. That was the cause for Walt Disney to have a connection to small town America. I’m pleasantly surprised to find someone who knows as much about Disney as me. Plus your older than me so its proof that your never to old to experience the magic.